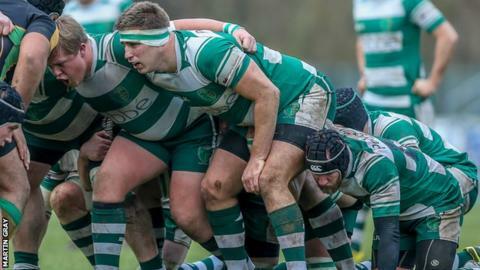 Guernsey Raiders boss Jordan Reynolds is hoping to increase his front-row options after the season has finished. They are currently sixth in National Three London and aiming for a best-ever finish within the English leagues. "We need more front-row and that's something I'm working heavily on at the moment," he told BBC Radio Guernsey. "Front-row is one of those things that you can't find someone locally and you can't find someone in the UK, you have to search long and hard for them." Guernsey have struggled up front this season because of injuries, and Reynolds is hopeful that he will be able to augment his current squad with new faces in the close-season..
"We want to be able to rotate guys like Leyton Batiste and Luke Gardner," added Reynolds. "Luke's been out injured for a long time now purely because he had to play a lot of minutes early doors, so if we can get some rotation going through there and a bit more depth in the front row I think we can do a job next season."